The Season Record is where you set up and define seasons and special dates so that the correct room rates apply according to the dates you set up. Select Manager/Setup > Hotel Control Files Setup > Season Record. It doesn't matter what letter you use (A-Z) and they do not have to be in alphabetical order. Once the seasons are defined you will create the rates for each season with in the Room Types or Rooms setup. Enter the year such as 2015 at the prompt. 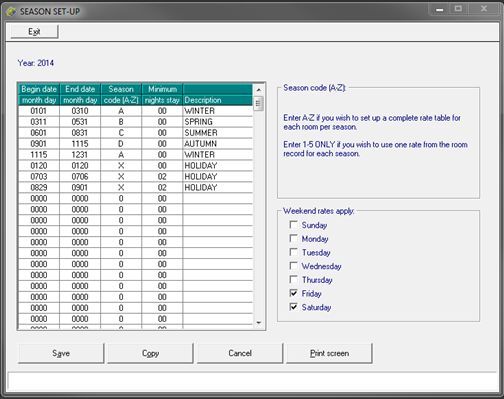 When the grid opens, enter the beginning and ending date for each season. The season record isn't required but if you use it you should make sure all calendar dates for the year are included. The dates apply to the stay nights, not the check-in or check-out dates. Each year should be set up separately; do not include more than one year per record. For example, do not enter starting date 1201 and ending date 0215 for a winter season. 1201 through 1231 would go on one year's record and 0101 through 0215 would go on the next year's record. Begin date month day is the calendar date the season begins. End date month day is the last calendar date of the season. Season Code (A-Z) is the one-letter upper-case code that designates the season for rate setup on Rooms or Room Types. The same season code may be used for more than one season. For example, if your winter rates are season code A and apply from December 01 through February 15, your calendar would include 0101 to 0215 as season code A and your calendar would include 1201 to 1231 for season code A. If your holiday rates are always season code H you can apply that code to all dates to which those rates should apply. Minimum nights stay sets a minimum-night requirement for all reservations and stays within the season. For example, if you designate a minimum two-night stay, a reservation for one night cannot be made unless an overbook password is entered. Description can be any wording up to twelve characters. If your rates change on specific days of the week, select those days in the section "Weekend rates apply". Those days will be considered weekends and weekend rates will apply on those days. The columns for those days will be shaded gray on the Tape Chart. Rates are set up in the Rooms or Room Types record. When finished setting up seasons, click Save or press Alt+A to save and exit. Press to exit without saving. To copy to another year click Copy or press Alt+O. 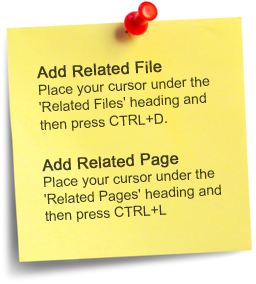 It may be faster to copy to another year and then edit dates as appropriate than to enter a new year from scratch. If you prefer to upload rates from an *.csv or *.xls file you do not need to use the Season Record. See Import Rate Spreadsheets.